Times of San Diego is introducing a new type of commenting for San Diegans who want to share their views on the latest developments in their community. 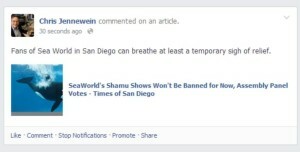 If you have a Facebook account and are logged in, you can immediately comment on any article on Times of San Diego. An example of comments on Times of San Diego automatically coped to a Facebook page. You won’t need to log in again, or wait for approval. Just scroll to the bottom of the article and begin typing. In addition, by checking a box under the comment, your comment and a link to the article will automatically be copied to your Facebook page. We chose Facebook to make it easier to comment and ensure a wider visibility for what you have to say. With 1.23 billion active users at the end of 2013, Facebook is the largest social network in the world. Using Facebook also keeps the online discussion civil. Many news sites are host to “trolls” and “flame wars” with anonymous posters writing things they would never attach their name to. When you post using Facebook, your name is visible. So be thoughtful and civil. Of course, if you don’t want your Facebook friends to see your comment, you can uncheck the box. Your name will be attached, but only those reading the article will see it.